By J.J. Hurtak, Ph.D., Ph.D., and Desiree Hurtak, Ph.D., MS. Sc. At any minute (starting 6th of March 2015) Jet Propulsion Lab scientists could be receiving a startling confirmation on vast water reserves on the dwarf planet Ceres as a result of the remote sensing technology onboard NASA’s Dawn Probe dawn.jpl.nasa.gov/. After some 3.1 billion miles, the spacecraft will answer questions on the nature of Ceres, particularly on the interior of a space object that may be 25% water. Dawn is already in orbit and making its spiral down to the surface of Ceres where it will take an investigative look at this icy world that some scientists believe could house primitive forms of extraterrestrial life under its surface. Ceres, the largest object in the asteroid belt, and its neighbor, Vesta, the second largest object in the area, may also provide vital clues on the nature of the asteroid belt between Mars and Jupiter that was formed out of debris encircling Jupiter from an earlier time of our Solar system. Some claim the asteroids are the result of a planet that was destroyed in the distant past. Now these two sisters have been classified like Pluto, as dwarf planets. According to Carol Raymond, a planetary scientist at Cal Tech’s Jet Propulsion Lab, these are exciting details about two intact proto-planets that have existed “from the very dawn of the solar systems… they are [in fact] two fossils we can investigate to understand what was really going on at that time.” Ms. Raymond is in charge of JPL’s program for studying small solar system objects in Pasadena, California. 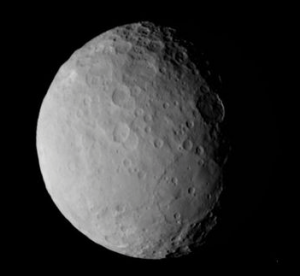 It will not be sending back pictures or data until late April (2015), when it reemerges from Ceres’s dark side. Then, the Dawn spacecraft is expected to measure the surface features of Ceres, especially the shapes and size of the numerous craters that pock mark its surface. Scientists believe that Ceres has something like 43 million cubic miles of water and most of it is probably frozen. According to several planetary scientists, Ceres is unlikely to have a liquid layer. Raymond also says, “One of the intriguing questions is whether that ice retains enough heat to be subject to convection.” The European Space Agency’s Herschel Space Observatory last year (2014) detected water upon Ceres by using a space-based infrared (IR) telescope. These findings come at a time when other NASA’s current programs (2015 data from Keck and Infrared Observatories in Hawaii) on the study of Mars have confirmed a more massive oceanic system on Mars that had existed in its distant past. New data reveals a global covering of water once existed on Mars reaching a depth between l30 and 137 meters over the entire surface of the red planet for a period of a million years, enough water and time to start life. This matches the planetary data the authors (Drs. Hurtaks) covered in a conversation with NASA scientists back in August of 2001 at a conference where we were guest speakers. The recent probes announcing the findings of massive water on the tiny Ceres and Mars in our Solar system bring us one step closer to an official announcements of finding exo-biological life forms in our own backyard. These findings come as no surprise to us, particularly to the thousands who were listening to us in our historic conversations on Televisa broadcasts worldwide on Mars with legendary journalist, Pedro Ferriz, and at several major auditoriums in Mexico City back in 1985. More recent updates have been made through journalist, Jaime Maussan in 2013 and 2014. Throughout the world, our lectures on “Life on Mars” for the last forty years have given factual clues and actual close-up pictures (Mariner-9) of massive water spillways and river systems that gave Mars its unusual network of canal-like features and oceanic water system that could have triggered Life millions of years ago. NASA can now start counting on its fingers the number of planets and dwarf plants that have potential for life in our Solar system. Watch for announcements on evidences of life beyond Earth coming in May 2015.